Addison’s Disease vs Cushing’s quiz. This NCLEX style quiz will test your ability to tell the difference between Addison’s Disease and Cushing Syndrome/Disease. These endocrine disorders are related to the adrenal cortex which is responsible for secreting steroid hormones (cortisol and aldosterone). Each disorder is related to a problem with either cortisol and/or aldosterone. 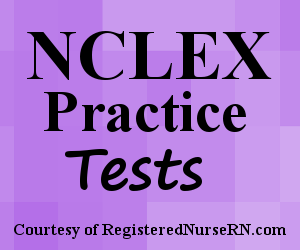 For the NCLEX exam, it is important you know how the typical signs and symptoms of each disorder, nursing interventions, and patient education. This quiz will test your knowledge on how to differentiate between Addision's Disease & Cushing's Syndrome/Disease for the NCLEX exam. A. A patient with a tumor on the pituitary gland, which is causing too much ACTH to be secreted. B. A patient taking glucocorticoids for several weeks. C. A patient with a tuberculosis infection. D. A patient who is post-opt from an adrenalectomy. 1. Which of the following patients are at risk for developing Cushing’s Syndrome? 3. A patient with Addison’s Disease is being discharged home on Prednisone. Which of the following statements by the patient warrants you to re-educate the patient? 4. A patient is admitted to the ER. The patient is unconscious on arrival. However, the patient’s family is with the patient and reports that before the patient became unconscious she was complaining of severe pain in the abdomen, legs, and back, and has been experiencing worsening confusion. In addition, they also report the patient has not been taking any medications. The patient was recently discharged from the hospital for treatment of low cortisol and aldosterone levels. On assessment, you note the patient’s blood pressure is 70/45. What disorder is this patient most likely experiencing? 5. In the scenario above, what medication do you expect the patient to be started on? 6. A patient with Addison’s Disease should consume which of the following diets? 8. A patient with Cushing’s syndrome will be undergoing an adrenalectomy. Which of the following will be included in the patient’s discharge teaching after the procedure? 9. Which of the following is not a typical sign and symptom of Cushing’s Syndrome? 10. In Cushing’s disease, the _______is secreting too much ACTH (Adrenocorticotropic hormone) which is causing an increase in cortisol production.